What else would you order for dinner your first night in Ireland? By the time we picked up our car at Dublin airport, drove into the city, laughed as we got lost and found in a maze of one-way streets and arrived at our hotel after Jennifer hung a u-turn to head the wrong way on one of those streets, it was dinner time. Foley’s Bar near St. Stephen’s Green was a short walk from our hotel. It’s a pub recommended by the folks at Haversham & Baker Travel, Ltd, the Cincinnati, Ohio, company that specializes in golf travel in the United Kingdom. We climbed onto high bar stools at a counter by the window facing the street. I ordered a half pint of Guinness even though I had tried Guinness stateside and never liked it. Two British brothers-in-law and a British nephew assured me the stuff I would get in Ireland wouldn’t be the same as what I drank at home. They were right. I loved it and ordered a full pint after draining the half. I didn’t go to Foley’s with Irish stew in mind. But once I saw it on the menu, I knew. I had to see how my homemade Irish stew measured up to an authentic one by actual Irish standards, I told Jennifer. We both believe my Irish stew is world class. Once, when Jennifer was in the hospital for a prolonged stay and she grew tired of hospital food, I suggested that I bring her dinner from home each night. 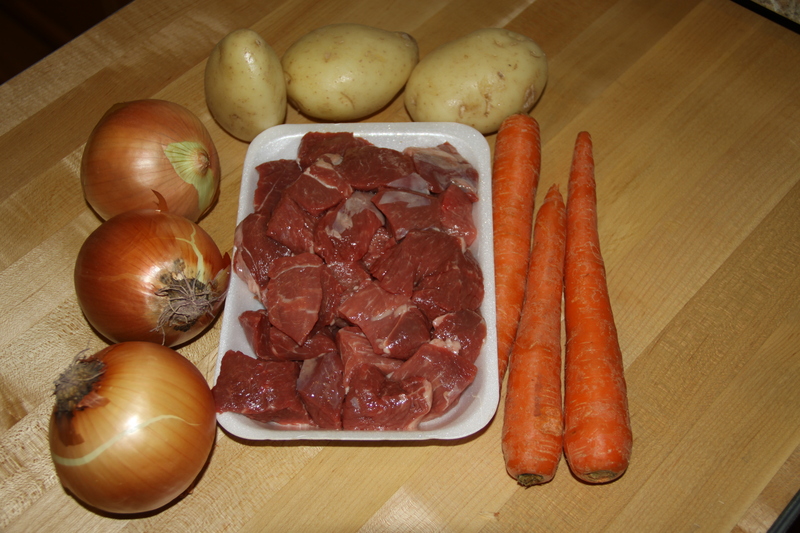 First up was an Irish stew, which she requested again the next night and the one after that. I still had most of my pint in front of me when the waitress brought our dinners. I sniffed the steam rising from the bowl of Irish stew. Before trying any of the lamb, potatoes or carrots, I spooned some of the thick broth toward my mouth and sipped it. I tried the lamb and then the vegetables. The entire dish tasted just like my Irish stew. Jennifer tried some and agreed. I think of that first night in Ireland about this time every year. With St. Patrick’s Day around the corner I debate whether I should make an Irish stew or stick with a traditional corned beef and cabbage. We each like each of these dishes. Jennifer prefers the stew because she prefers any stew. I give a slight edge to the corned beef because that’s what I grew up eating and even though it’s an Irish tradition, corned beef is true kosher deli meat. St. Patrick’s Day is just an excuse. I could enjoy corned beef and cabbage or Irish stew any night of the year. 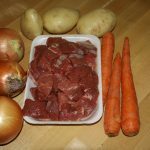 This year it’s Irish stew in February and corned beef and cabbage is planned for March 15. Here’s a stupefying number. If you Bing ‘corned beef and cabbage recipe’ you’ll get 1.67 million listings. Try ‘Irish stew recipe’ and you’ll find 2.28 million listings. I don’t get it. Corned beef and cabbage is about as simple as anything can get in the kitchen. I can’t for the life of me figure out how there could be 1.67 million recipes for something that easy to prepare. Of course, when I finish and post this article there will be 1.67 million and one. Irish stew is a bit more complicated. But there cannot possibly be 2.28 million ways to make it – at least not 2.28 million ways to make the Irish stew that is served at my home and at Foley’s in Dublin, Ireland. Cut the lamb into 1½-inch cubes. Trim the fat. Place the meat in a large saucepan with 2 cups of stock. Bring to a boil. Cover and simmer for 1½ hours. Scrub the potatoes and peel the onions and carrots. Cut the vegetables into thick slices or wedges. Add the vegetables to the stew pot. Add salt, pepper and 1 ½ more cup of stock. Cover and simmer 45 minutes longer. For you traditionalists, here’s all you need for a delicious St. Pat’s Day Dinner. At your local butcher shop or super market buy a piece of corned beef brisket. About 8 ounces per person should do it. Don’t worry if it’s larger than what you need. I’m going to give you a really neat recipe for the leftovers. Try to buy the point end of the beef with all the fat. It will keep the meat juicier. If you can’t get the point end, a flat end will work. If you’re going to have a big party, get the whole corned beef. Cook the beef in a large pot with enough water to cover the meat. Be sure to use all the spices and flavorings on the meet and any flavoring package that might come with the meat. Bring the water to a boil and cook the meat on a slow, rolling boil. Two hours should be enough for the flat end; two and one-half hours for the point end. If you have a whole brisket let it have the full two and one-half hours. Allow about 1 medium white skin potato per person. Scrub the potatoes but don’t peel them. Cut the potatoes in halves. Add them to the pot. Bring the water back to a boil and cook the potatoes about 30 minutes at a slow boil. Remove the meat to a carving platter and cover it with tin foil to retain the heat and let the juices settle. Allow about one-quarter of a medium head of cabbage per person. Cut the cabbage into quarters, leaving the hard stem attached so the cabbage doesn’t cook apart. Add the cabbage to the pot about 15 minutes before the potatoes will be done. Bring the water back to a slow boil and cook for 15 minutes longer. Slice the meat thinly across the grain and serve family style with one potato and one piece of cabbage per person. I love this with hot English (Coleman’s) mustard. Plain yellow mustard works if you don’t want the heat. Some people like to put chunks of carrots into the water along with the potatoes. I prefer my corned beef without the carrots. If you have any left overs here’s an idea for breakfast. Cut the meat into half inch pieces. After the potatoes have cooled, dice them into half inch pieces. Dice half an onion. Melt some butter in a wide frying pan. Sauté the onions until soft but not browned. Add the potatoes and sauté until they begin to brown, tossing them occasionally. Add the meat until it’s heated. Top this with a fried or poached egg and you’ll have your own version of corned beef hash. If there’s any leftover cabbage, make sure it’s completely dried. Chop it into large pieces and sauté it in butter for a version of what the British call ‘bubble and squeak.’ Serve it as a side with the hash.